A friend wants me to look for Mothra DVDs in Japan. I am a fan of the Toho studios tokusatsu films so this will be an easy enough request. Might need to write done the Kanji for Mothra and remember to get a region 0 DVD. Would love to find something that has subtitles and not those horrible horrible atrocious dubbed American voices. 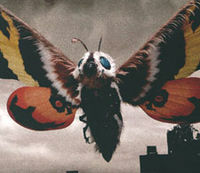 Rebirth of Mothra triology of fims looks good. Hopefully I can find a set in open region DVD.